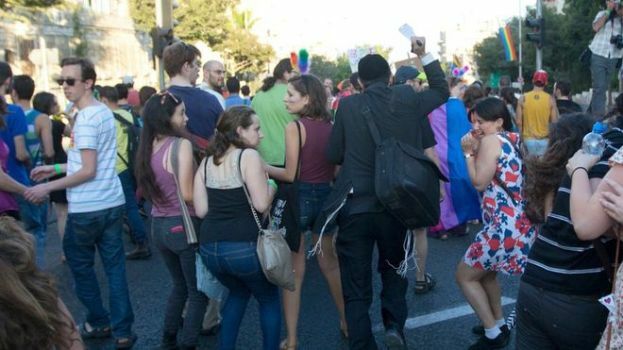 Police have arrested a man after six people were wounded in a stabbing at the Gay Pride parade in Jerusalem. A police spokesperson told the BBC that the suspect was the same man who stabbed three people at the parade in 2005. Two of the injured are in a serious condition, the ambulance service said. Eyewitnesses told Israel’s Haaretz newspaper that the attacker emerged behind marchers and began stabbing them while screaming, before being tackled by a police officer. Yishai Avior told Israel’s Channel 2 TV he heard screaming and saw three people on the ground bleeding. “People ran in every direction to take cover… There was immense panic and shock,’’ he said. The parade continued after the wounded were taken to a hospital, with protesters chanting “end the violence”. Israeli Prime Minister Benjamin Netanyahu said the attack contradicted the country’s “basic values”. “In the state of Israel the individual’s freedom of choice is one of basic values. We must ensure that in Israel, every man and woman lives in security in any way they choose. That’s how we acted in the past and how we’ll continue to act. I wish the wounded a speedy recovery," he said in a statement. Hundreds of police are deployed along the parade route to prevent violence breaking out. Jerusalem police spokesman Asi Ahroni told Reuters there was a “massive presence” of police at the parade but “unfortunately the man managed to pull out a knife and attack”. The event has long been a source of tension between Jerusalem’s secular majority and its Jewish Orthodox communities. Ultra-Orthodox Jews have previously gathered in the city’s Mea Shearim quarter to protest against homosexuality.